Canada is a dream destination for anyone who aspires to acquire an international education. In India, if we talk about the most popular international education destination than it is none other Canada. The factors that make Canada, the most preferred choice may include; world’s highest quality of life, safe learning, and high standard of education at a very reasonable cost. The country welcomes more than 180,000 international students almost every year. Canadian education has helped thousands of students shape their careers in the best possible way. These potential career prospects on acquiring Canadian education make Canada a most sought after international education destination. This huge admiration for Canadian education has but obviously raised the standards for securing admission to Canadian universities and colleges. English Language proficiency is one such obligation that needs to be met to study in Canada. IELTS (International English Language Testing System) is one such test that is taken by the students, to prove their English language proficiency to study in Canada. 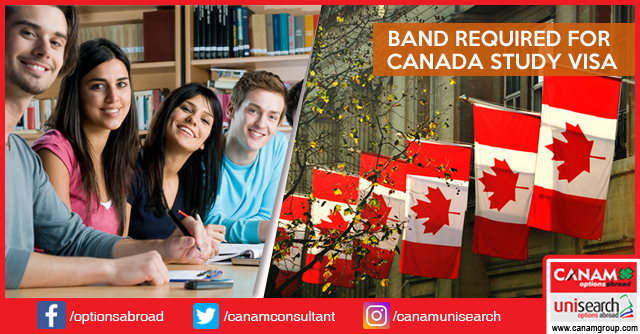 However, Canadian High Commission has a requirement of 6.0 bands in IELTS for an undergraduate degree with no band less than 5.5 issued in the past two years, and overall 6.5 bands with no band less than 6.0 are must for getting admission in post graduate degree in Canada. All Canadian Colleges and Universities accept the IELTS scorecard to analyze the ability of an applicant to read, write, speak and understand English. This requirement of IELTS score is waived off in case the applicants have completed their education from a recognized educational institution and have earned their qualification in English. Applicants can apply for Canada Student Visa by furnishing necessary documents to support their claim of English language proficiency like certificates, documents stating that the medium of instruction in the first or last obtained degree was English, and transcripts. Proving your language skills to Canadian High Commission and beginning your studies in Canada is not as complex as it sounds. With the guidance of an expert consultant, you can find a way of fulfilling your dreams to study in Canada. This is where Canam Consultants Limited has a great role to play. With over 21 years of experience in delivering successful visas to thousands of students’ year-on-year, Canam has tie-ups with a wide range of educational institutes that offer programs and courses to match every student’s capacities and potential. Also, these institutes have varied admission requirements to facilitate maximum students, to the programs of their choice. With expert guidance and reliable services from experts, Canam focuses on providing the latest updates and best possible study visa solutions. Visit your nearest Canam office today, for your Canadian study permit application, or call at Toll-Free No. 1800 137 8055. How a Canada Study Consultant makes your dream come true? How to Finance Your Childs Study in Canada? Why Should One Choose Canada to Pursue Their PhDs? Study Abroad Resources – Blogs | Canam Consultants Copyright © 2019.